Our pool features a beautiful, shallow, and warm water that makes learning in each swim class that much more enjoyable. 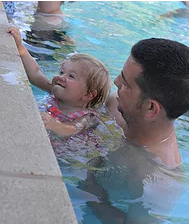 Our pool is heated to 89–90 degrees and has a shallow end at just two feet to help young swimmers feel comfortable in the water from the very beginning. Morning and evening classes are offered in two–week blocks. Our swimming program runs from June through August. Registration for swim class begins in April. Our spacious pool area provides changing space, outdoor heaters, and a place for parents to watch. All instructors are WSI certified and our class ratio is 6:1. 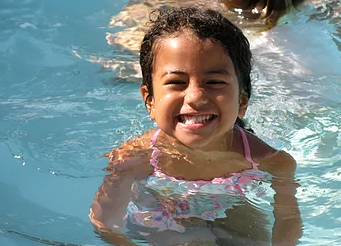 Water safety skills are taught at all swim class levels. Get The 2019 Swim Flier Now! A 10 percent discount applies to families with two or more swimmers enrolled in the same session. All classes are 35 minutes long and meet Monday through Thursday in two week blocks, with weather–related cancellation makeups on Fridays and Saturdays. 9:00 a.m., 9:45 a.m., 10:30 a.m., 11:15 a.m., 12:00 p.m., and 5:30 p.m. or 6:15 p.m. There are a variety of levels offered at each class time during each session. Swim class level descriptions are listed below. View our Class Grid to pick a level for your child and see what levels are offered at what times for each session. Offered only for Wave Riders 1. Stay with your teacher and swim class for two consecutive sessions! If your swimmer is a beginner and is interested in signing up for 2 consecutive sessions, consider a Super Session. For the specified block of sessions, your swimmer will meet at the same time with the same teacher and the same class. The swim class will progress through one to two swimming levels together. This takes the guesswork out of anticipating what level your swimmer will progress to after their first session. Payment for all specified sessions is required at time of enrollment. There is a $20 cancellation fee per child/per class for cancellations received up to 7 days prior to the start of class. There is no refund if cancellation is less than 7 days prior to the start of class. There are no makeups or credits for missed classes. If classes are cancelled due to weather, we will add up to 10 minutes to class length to make up. If this option is not available, classes will be held at their regular class times on Fridays. This is a parent/toddler water–adjustment, introductory swim class for ages 6 months to 3 years. This parent/infant class covers parent skills, such as holding positions, cues, and basic safety. Infant skills cover water adjustment, exploring the pool, front kick, prone glide, blowing bubbles, back float, arm movement on front, and water entrance and exit. This parent/preschooler transitional swim class is the perfect way to get your young swimmer used to navigating the water with you close by. During the first week of this class, parents are in the pool with their children. During the second week of swim class, students are in class without a parent. By the end of class, most swimmers will be ready to move into our Wave Riders program without a parent. 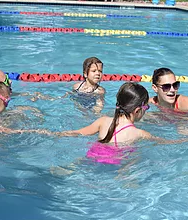 This introductory swim class is for graduating Splash or Beach Comber students that are beginning swimmers that have turned 3 before their first class. Classes will focus on skills from our skill–evaluation checklist that they will receive by the end of the two–week session. These skills range from water adjustment and getting their faces wet to more difficult skills like jumping into the water and stroke introduction. Level 1: No skills needed. Level 2: Must be able to fully submerge, blow bubbles, flutter kick, and back float with help. Level 3: Must be able to front float and glide, beginning arm stroke, back float with help, jump into chest–deep water, and level off to float, as well as recover from a front and back float. Level 4: Must be able to do a front glide with flutter kick, back float, elementary backstroke with help, hold breath underwater 10 seconds, jump in, and level off to float. Students who complete Level 4 will be ready for Swim Stars Level 3. These swim classes are well–suited for beginning through advanced swimmers that are 6 to 12 years old. We offer a range of levels from 1-6 that will focus on beginning skills like confidence and navigating the water all the way up to intermediate and advance stroke work. Level 2: Must be able to fully submerge, front and back float with help, flutter kick, beginner elementary backstroke with help, and recover after a front and back float. Level 3: Must be able to front and back float alone, front glide, beginning crawl stroke, elementary backstroke for 10 feet, jump in chest–deep water to float and kick, and return objects from the bottom of the pool in chest–deep water. Level 4: Must be able to crawl stroke with rhythmic breathing, turn from front to back float, backstroke for 15 feet, tread water for 30 seconds, and jump into deep water. Level 5: Must be able to front crawl with rotary breathing for one pool width, backstroke for one pool width, and elementary backstroke for one pool width. Level 6: Must be able to front crawl with rotary breathing for two pool widths, breaststroke for one pool width, side stroke for one pool width, and beginning butterfly. Not all Colorado days are sunny and perfect. Because our pool is located in the beautiful outdoors there is a chance that weather will not be suitable for lessons on some days. If classes are canceled due to weather, make-ups are scheduled either on Friday or Saturday of the same week. Students will receive communication from their teacher or our administration when make up classes are scheduled.